Irish soda breads are wonderful loaves that everyone should make at least a few times in their lives. These quick breads require no yeast and are instead leavened only with baking soda. The use of a chemical leavener in this bread means that there is no rising time and minimal mixing to do before you can put your loaf in the oven, so you can have freshly baked bread in no time at all. It is also easy to put a unique twist on a basic soda bread by using mix-ins to make the loaves sweeter or more savory. 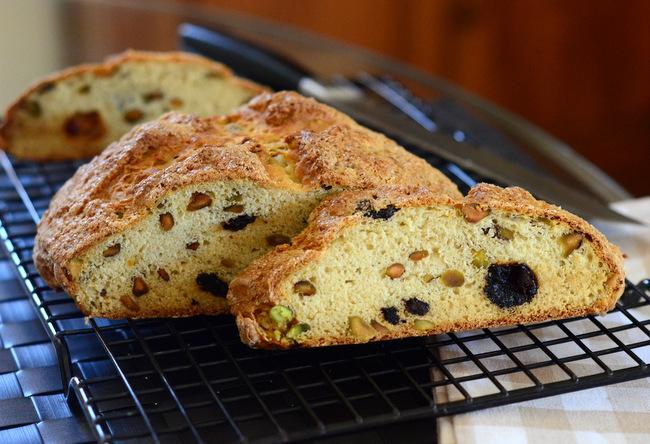 I took a sweeter track with this delicious Cherry and Pistachio Irish Soda Bread. The bread has a buttery tang and a slight sweetness to it that really sets off the fruity cherries. I used dried bing cherries, however any type of dried cherry that you have on hand can be used. To spread the cherries out more evenly in the loaf, chop them into small pieces instead of using them whole. Pistachios add some color and a bit of crunch to the bread, and pair well with the cherries in general. As usual, I recommend using toasted nuts so that you get as much flavor from them as possible. This bread is on the sweeter side of to soda bread spectrum, thanks to the inclusion of sweet-tart dried cherries and a dusting of sugar on top of the loaf. This makes it an excellent choice for breakfast or brunch because it is especially delicious when spread with butter and jam or honey. If you have cherry preserves, they would be the perfect pairing here. The bread is at its best when it is still slightly warm from the oven, however it also makes outstanding toast if you aren’t able to eat the whole thing right away. In a large bowl, whisk together flour, baking soda, salt and sugar. Stir in half of the buttermilk, the pistachios and the cherries. Pour in remaining buttermilk, and stir until dough comes together into shaggy ball. Place dough on a lightly floured surface and knead for about 1 minute, just until the dough comes together and you can shape it into a fairly smooth ball. Press into a disc about 1 1/2 inches high and place on prepared baking sheet. Brush with a bit of buttermilk and sprinkle with approx 2 teaspoons of coarse sugar. Cut a deep cross in the top with a sharp knife. Bake 30-35 minutes, until the top is a dark golden brown. A toothpick will come out clean when inserted into the center. This looks yummy especially since i’m a sucker for warm bread!! Made this one for a breakfast/brunch for my favorite gardeners this morning. Big hit. I opted to make the bread into drop scones instead of a loaf type bread. Worked really well. And easier for them to eat on the run instead of having to slice bread. Really nice recipe. Thanks for another great one. I definitely recommend the drop-biscuit method and bake around 16 minutes. They were lovely and browned but still soft inside. And my friend, Jonn, loved the flavors and them not being overly sweet. Thanks, Nicole! !